Over the past few years I have been asked a number of times: Do you have magical powers? My answer is that I don’t see myself as a magician. I create jewelry with great intention and seek to combine beauty and esthetics with unique meaning that together can provide keys to achieving those things that you want most in your life. The jewelry is a key to the immense power that you have within you. What make a beautiful piece of jewelry into the key to fulfillment? Imagine yourself at a wedding with the partner who you truly love. Your partner is wearing on their finger a ring. The ring is beautiful but, for you, it also symbolizes something far more powerful. The ring is a constant reminder of the commitment between you and your partner to be there for each other. It is a ring dedicated to love. It is the same thing I try to create in my jewelry, using well-known symbols from different cultures. Take, for example, the Diligo Ergo Sum ring (see below) - imagine wearing it solely as a thing of beauty - that is in itself is nice. But now, imagine wearing it whilst connecting to and focusing on the deeper meaning of the ring (I love, therefore I am)! All of sudden your entire existence is transformed. Your way of being is love and love becomes a powerful part of your every day existence! Even though I’m not a magician, I do believe that my genuine good intentions and the preparations I make in the creation of each piece of jewelry, allows you to feel the authenticity that pervades the jewelry. I believe that jewelry created with pure intentions is different from a piece of jewelry made by exploited workers in Thailand or China. I invite you to enjoy the wonderful combination of beauty, meaning and pure intentions. A beautiful ring that contains the symbol of the crane and the cherry blossom taken from Japanese culture. The ring is designed to bring the wearer beauty and tranquility. The ring is available in two versions - one wide and the other thin. On the ring is engraved the phrase “Diligo Ergo Sum” - I love, therefore I am! The ring is a paraphrase of the well known phrase of the philosopher Descartes - I think therefore I am! This is a ring of love that places love in the center of our existence and focuses the wearer on the importance of love in our lives. The ring is based on the structure of the M51 galaxy. The purpose of the ring is to create within us a feeling of wonder of our vast universe and to put into things occurring in our everyday lives into proportion. This is a unique astrological ring made only at specific times during the month and in accordance with recommendations made by an astrologer. The ring contains 7 metals, each one relating to a different star in the Chaldean astrology order. The ring is meant to bring the wearer success and protection. The pendant is based on the pattern of Mars’s movement in relation to the Earth. Mars is the planet of strength and power. The pendant was created with the intention of bringing the wearer the power to take action, to be assertive and to have active energy. The pendant is based on the pattern of Venus’s movement in relation to the Earth and contains a thin sheet of copper at its center. Venus is the planet of love, beauty, fertility and harmony. 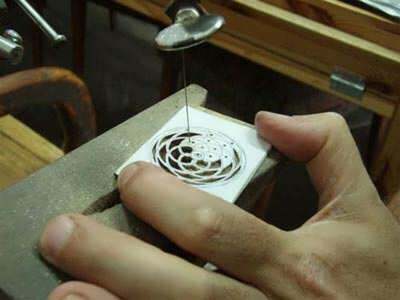 The pendant was created with the intention of connecting the wearer to the harmony and beauty of the world.